Terry Lee Goffee has been a Johnny Cash fan since he was 8 years old. 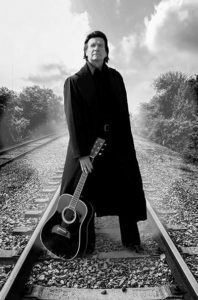 His long-running admiration for the music and the man is apparent in his performance as Cash in “The Ultimate Tribute to Johnny Cash,” brought by Crossings to the Zumbrota State Theatre on Fri, June 28, at 8 p.m.
Goffee does more than play the music or “impersonate” Cash: like an actor in a play, he becomes his character from the moment he walks on stage until the end of the show. He plays the music so well audiences and reviewers rave. He plays the man so well, he was chosen to provide the moves for a Cash character on the Guitar Hero 5 video game. He looks like Cash. He sounds like Cash. He moves like Cash--Nobody does Johnny Cash like Terry Lee Goffee. Cash – The Man in Black – is widely considered one of the most influential American musicians of the 20th century. His music is primarily thought of as country, but his deep bass-baritone voice lent itself equally well to the genres of rock and roll, blues, folk, rockabilly and gospel. He traditionally began his concerts with the simple “Hello, I'm Johnny Cash” – a signature greeting supplied by Goffee for the Guitar Hero Cash character. Goffee’s tribute show has taken him all across the United States, Canada, Ireland and the United Kingdom. In truth, he’s just back from Ireland and the UK where he represents one of America’s Great Entertainers to an international audience.